Helping My Hero!! is an early-reader book for 4th-6th grade children, whose parent may have combat trauma. This book tells the story of two military families and their experiences dealing with Post-Traumatic Stress Disorder. Christ-centered solutions are presented for the issues the families face. The book contains explanations of many of the issues and terminology the children encounter. Scripture verses are highlighted which help the child with the issue addressed in each chapter. 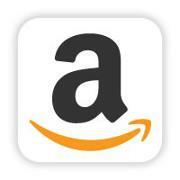 “Discovery” items and “Positive Activities” provide suggestions for taking action. And each chapter ends with a prayer by one of the main characters and his or her promise for action. This is book two in a series of children’s books produced by Cru Military, a division of Cru. The first book, My Hero’s Home!! is for K-3rd grade children, and the third book, My Hero Hurts!! is for teenagers. All the books follow the same structure used in the book When War Comes Home, by Chris and Rahnella Adsit and Marshéle Carter Waddell, which is a workbook for wives of combat veterans dealing with PTSD or TBI. This book is designed to help young children begin to understand the effect of PTSD on a military family. It is written lovingly to guide families through the difficult transition from war to home. The goal of My Daddy Has PTSD is to provide support and promote outreach for veterans and their families as they cope with the symptoms of Post Traumatic Stress Disorder. Full color photos on 52 pages explore the daily life of a young child with strategies to support and solve difficulties that the family experiences due to PTSD symptoms. My Daddy Has PTSD is a simple story that follows a young boy as he learns that his combat veteran father has Post-Traumatic Stress Disorder, or PTSD. The book asks the question, "What is wrong with Daddy?" and politely answers by saying, "Daddy is going through some things, but here's how we can help." Along with the character in the story, children of all ages will enjoy learning about common symptoms of PTSD. 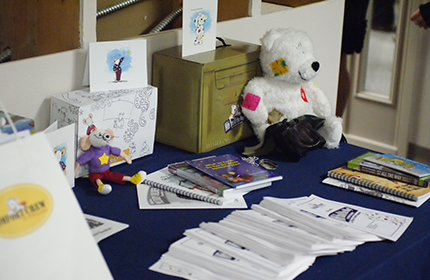 Cru Military introduces Book 1 of 3 for children whose families are experiencing Post Traumatic Stress. Follow the story of Cody and Carrie as they discover how and why combat trauma is affecting their family. Explore how God brings the answers to healing, better family relationships, and a brighter future for families struggling through combat trauma. Included are activities for children to personalize their story, learn about and contribute to a positive atmosphere in their home. Parents pages are also include with helpful information for Mom or Dad. Written as a tool for military personnel and their families, "Simon" bridges the gap for readers who may be experiencing their own delayed stress symptoms, confusion or lack of coping skills to deal with the aftermath of their Homecoming. Sparrow is designed to support a young child whose parent has experienced a physical or emotional injury/illness. Sparrow (papa version) tells the story of a young bird whose beloved parent has been away on a long journey. When Papa finally returns home from his journey, young Sparrow notices that he seems different. Papa is tired and weary and his wing is clipped. Papa and young Sparrow cannot fly together like they used to do. Everything is so different that young Sparrow begins to wonder if Papa’s feelings for him have changed as well. Papa reaches out, offering Sparrow the assurance that he needs; papa loves Sparrow, now and always. Sparrow learns that although he and Papa can no longer fly together, they can be together—and that means everything. With this kit, families can encourage and support one another when challenged with the obstacles of reintegration. The Taking Care of You! Support for Kids of Injured Heroes Kit supports families and children ages six and older who are experiencing a loved one's return from deployment with visible and/or invisible injuries. The Injury Care Kit features the Taking Care of You! Support for Kids of Injured Heroes DVD created by the Trevor Romain Company with the USO, and provides resources that help military children understand the types of injuries as well as recovery and reintegration processes. All housed in a Care Kit Box to keep treasured items safe. PTSD is a very tough subject for children to understand. Author Maggie Hundshamer, a USMC veteran, has written this book to help you explain the subject to your children and give them a way to help you as much as you help them. Kids who have a parent with post-traumatic stress disorder (PTSD) can often feel confused, scared, or helpless. Why Are You So Scared? explains PTSD and its symptoms in nonthreatening, kid-friendly language, and is full of questions and exercises that kids and parents can work through together. The workbook-style layout encourages kids to express their thoughts and emotions about PTSD through writing, drawing, and designing. 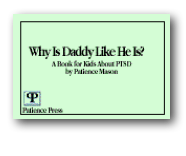 This book can serve as a practical tool for kids to cope with and eventually understand their parent's PTSD. A simple explanation of the symptoms of PTSD and reassurance that it is not the child's fault. Works for adult children of veterans, and for veterans, also. The children’s issues picture book Why Is Dad So Mad? is a story for children in military families whose father battles with combat related Post Traumatic Stress Disorder (PTSD). After a decade fighting wars on two fronts, tens of thousands of service members are coming home having trouble adjusting to civilian life; this includes struggling as parents. Why Is Dad So Mad? is a narrative story told from a family’s point of view (mother and children) of a service member who struggles with PTSD and its symptoms. Many service members deal with anger, forgetfulness, sleepless nights, and nightmares. This book explains these and how they affect Dad. The moral of the story is that even though Dad gets angry and yells, he still loves his family more than anything. The children’s issues picture book Why Is Mom So Mad? is a story for children in military families whose mother battles with combat related Post Traumatic Stress Disorder (PTSD). After a decade fighting wars on two fronts, tens of thousands of service members are coming home having trouble adjusting to civilian life; this includes struggling as parents. Asymmetrical warfare has blurred the lines of women in combat roles, female veterans are impacted by this through current conflicts more than ever. Why Is Mom So Mad? is a narrative story told from a family’s point of view (father and children) of a service member who struggles with PTSD and its symptoms. Many service members deal with anger, forgetfulness, sleepless nights, and nightmares.This book explains these and how they affect Mom. The moral of the story is that even though Mom gets angry and yells, she still loves her family more than anything. Why Is Mommy Like She Is? The children of five mommies with PTSD from different experiences while deployed talk about PTSD with their counselor. A book for the children of women with PTSD, which describes the symptoms of PTSD in simple terms and reassures children that it is not their fault. There are many different ways to be wounded. Marcus and his sister and mother are counting the days until Marcus's father comes home from Afghanistan. Waiting weeks for a phone call, and with only the occasional e-mail, has been difficult for the family, but they're ready to celebrate his return. When the big day comes, they're overcome by happiness and relief that he's safe, but as the days pass, Marcus begins to feel that there's something different about his father. He barely sleeps, he's obsessed with news from Afghanistan, and while at times he seems almost too happy, at other times he's erratic and aggressive. Marcus knows that post-traumatic stress disorder affects many soldiers, but at first he finds it hard to believe his father needs help, and then when he does think he needs counselling, he just can't seem to convince his father. Award-winning Canadian author Eric Walters offers a rare and insightful look into the unseen, often unspoken, emotional cost of war in this groundbreaking new novel. Note: As with the majority of the books listed on Operation We Are Here, I have personally read this book. As the description suggestions, this book speaks of the "often unspoken, emotional cost of war." I suggest parents read this book first to determine whether it is fitting for their teen to read due to some of the content. I do recommend that military supporters read this story to give insight into the emotional cost of war from the view point of a teenager. A Sergeant in the House tells the story of Lenny who desperately wants a puppy. His father is in the military, the family must move frequently, and Lenny is still very young to care for an animal, so Lenny strikes a bargain: When his daddy becomes a sergeant, Lenny can have a puppy. When his father is deployed to war, Lenny learns what it means to be responsible, to care for his family, and to help around the house. A dreaded phone call brings the news that Lenny's father has been injured and is being sent home. When Lenny's father explains that this means he'll never become a sergeant, Lenny realizes that what he truly wants is his daddy puppy or no puppy. Big Boss Brain is an unprecedented look into the often invisible effects of traumatic brain injury (TBI) through the eyes of a child. Main character, Cassidy, guides readers on a journey of discovery to learn and answer questions about the physical, cognitive, and emotional/behavioral changes in a loved one following a TBI. Characterized images of Big Boss Brain further reinforce understanding of the brain's function, control, and damage in a manner kids can easily understand. The story captures the reader's attention and imagination, allowing them to believe in the possibilities of life together after traumatic injury. The often invisible effects of TBI are difficult for adults to fully comprehend; more so for children who are discovering the world around them. Big Boss Brain is a way of providing children with a vehicle to understand TBI and realize that they are not alone. While intended for children, Big Boss Brain also is instructive for adults. According to the Centers for Disease Control and Prevention, approximately 1.7 million people sustain a traumatic brain injury (TBI) annually. Understanding this growing population, author, Shannon Maxwell, once again draws upon her family's experiences following Lt Col Maxwell's penetrating TBI to create a must have resource for any family navigating or wanting to learn more about traumatic brain injury. Illustrator, Liza Biggers joins Maxwell in this second collaborative endeavor -- the first - Our Daddy is Invincible! -- bringing to life images sure to captivate readers of all ages. All it takes is eight seconds . . . Cam O'Mara, grandson and younger brother of bull-riding champions, is not interested in partaking in the family sport. Cam is a skateboarder, and perfecting his tricks—frontside flips, 360s—means everything until his older brother, Ben, comes home from Iraq, paralyzed from a brain injury. What would make a skateboarder take a different kind of ride? And what would get him on a monstrosity of a bull named Ugly? If Cam can stay on for the requisite eight seconds, could the $15,000 prize bring hope and a future for his big brother? Jack's Daddy is acting different, but he still looks the same. When Daddy comes home with a brain injury, Jack struggles to accept the new changes in him. Jack associates Daddy's new behavior with all sorts of wild animals, from a forgetful Squirrel to a grumpy Grizzly Bear. Follow Jack on this incredible journey into acceptance and the life lesson that Love can survive any injury. Daddy's Different tells the often untold story of brain injury through a child's eyes. Beautifully written and illustrated, Daddy's Different gives a voice to brain injury's smallest victims and offers insight into this mysterious world. Hero at Home was inspired by the author's personal family journey: having three young daughters and a catastrophically wounded veteran husband. Grace's dad is an inspiration to so many, but he is not the only one in his family who deals with scars of war. This book is dedicated to the brave men of Bravo Company, 2-508th Parachute Infantry Regiment, 82nd Airborne, who fought alongside Grace's dad-the ones who came home, and in loving memory of the ones who did not. An important read for those wishing to embrace the Wounded Heroes in their community and better understand that for these Heroes, the fight doesn't end when they return home. The mission continues and is a family affair. Injuries from military service can be both visible and invisible. Hero at Home celebrates the contribution that our veterans have made, and shines a light on how vital it is to embrace these special families. This book offers young readers practical coping tools to empower children to feel confident about themselves and become a more active participant in his or her injured parent’s life. While brain injury is a complex topic, it is an unfortunate fact that certain types of brain injuries, which are all too common in military personnel, affect a person’s behaviors such as mood and temper. A previously kind and loving parent may become irritable, short-fused and be intolerant of frustration after a brain injury. To a child, this change can be scary and overwhelming. Children may not understand why Mom or Dad is so different and may blame themselves. What happens when a parent becomes traumatically injured? In Our Daddy Is Invincible! Alexis and Eric find out that their Daddy was badly hurt, something they thought impossible. They are scared for him and wonder how his injuries will change their lives. They learn that his love for them continues to be strong and that life goes on. There are people to help in their daddy's recovery, new adventures to be found, and new ways to find enjoyment together as a family. Turn the pages of this beautifully illustrated, hope-filled book and discover the possibilities. Our Daddy Is Invincible! is based on the true story of a Wounded Warrior and American hero and his family. Possum Summer is an uplifting novel about a girl and her father whose fractious relationship is healed by the hard lessons they learn about love and letting go. Eleven-year-old P (short for Princess) longs for a pet, but her father insists that all animals on their Oklahoma farm earn their keep. While he's away on combat duty, P rescues an orphaned opossum that she names Ike. When her father is injured and her world falls down around her ears, P knows she must find it in herself to betray Ike's trust and force him to survive in the wild - no matter how much it kills her to do it. When Abbey's dad goes overseas to serve in the military, she's very proud of him. But when he gets hurt and has to come home, Abbey's life changes. Join Abbey as she learns how to help her dad and his new pal, Tori the service dog, in Still My Dad. 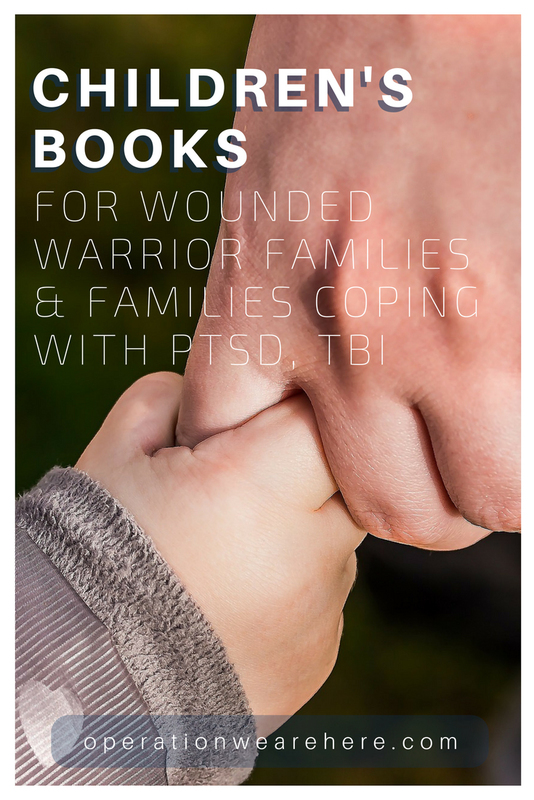 The Healing Heroes Book: Braving the Changes When Someone You Love is Wounded in Service is an interactive book that helps children and families of wounded service members deal with the feelings, changes and challenges they face because of their loved one's injury. 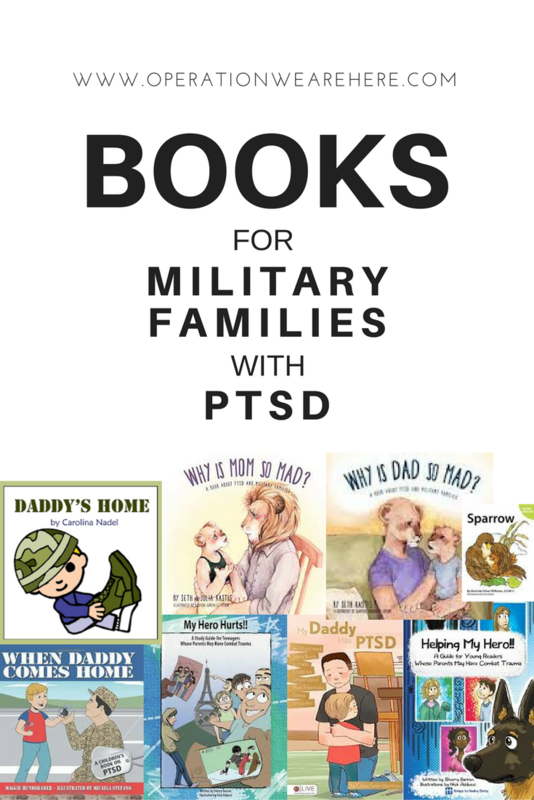 This 64 page book combines educational narrative, conversation starters, activities, and journal-style pages to help children appreciate their military family, explore their feelings, ask questions, confront their concerns, and find ways to feel better when they are down. Kids become the co-author of their book and it can be a powerful tool in their healing process as it opens lines of communication while supporting children and family members with information and suggestions of healthy ways to cope and move forward.